Anybody ever find one? Seems like they started to fall off early this year. Last month already up here. I have quite a few,to many actually.i do not go looking for them but pick them up in my ramblings threw the woodlot.Always find some huge ones that make me wonder where the were during the season.I have a client that has a "bone tree"they have been putting sheds in for a number of years,it is kind of unique when you see it in the middle if the bush. I have 3 antlers that I've discovered out in the woods. Biggest antler was 7 points and the smallest was a spike, about two inches long. I also have 4 skulls from dead deer I've come across. I jumped up two big bucks on my walk today, both had their antlers still. We go out in late February in our area. I found one with the back tire of my tractor once, I have no idea why it didn't puncture it. The only reason I knew it was there is because it wedged in and hit the fender on the way up and made one of those really loud noises you don't ever want to hear when you're cutting silage. 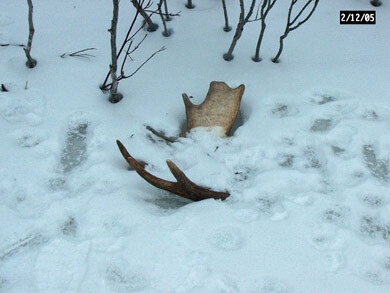 I find moose sheds around here once in awhile because I have a lot more moose than deer. As you can see from the tracks, the coyotes are curious about sheds to. Probably wondering where the meat went I hope, one day, to collect a moose antler. Naw, they probably just came from the dead cow carcass pile on the back of the farm. One time we were hunting and had a trailer parked in a pit. Not far from there was a spot where DNR dumps dead deer road kills. Well the coyotes went nuts around there at night, as we had spaniel bird dogs in the back of the truck under a topper and both parties howled back and forth all night. Grandfather did get out the shot gone once in the night and made some noise, but they never went far away. Hey never know. Maybe some Indian traded it for a catfish or a spear head. I wonder if one could have washed down from Minnesota. Them wood chucks would just toss it in the pond just like his firewood! No beach anywhere close to where I live, no moose antlers either. Now, I guess I know why. Page created in 1.112 seconds with 39 queries.